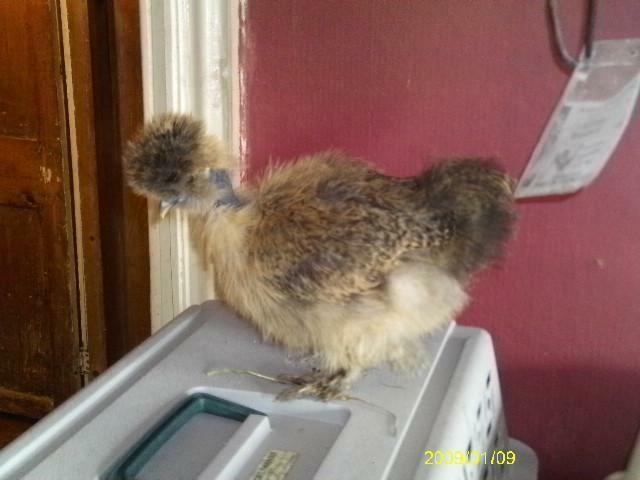 Showgirl's are a mixed breed between Silkie and Naked Neck Turken. They are not yet reconized as there own breed, but for showing they go under AOV silkie ( All other variety silkie) Variety is Showgirl. They are a Bantam. It took generations to get them to look this good. Showgirls are very tame and they love attention, They are the sweetest bird around possible. Just like the Silkie. The Silkie breed was developed in the Orient, Most likely in Japan. The Naked Neck Turken was Originally from Central Europe, it was originated in Hungary and largely developed in Germany. They are an ornimental bird. Showgirls come in all different colors. There are White, Blue, Black, Red , Buff, Partridge, Splashed. They should have a full crest (FULL HEAD OF FEATHERS). You do not want to breed 2 showgirls together, They should be bred 1 showgirl to 1 silkie. If they are bred the wrong way the chicks will come out with less feathers on the neck and chest, and you do not want this. This is a Pair of White Showgirl pullet and cockerel. They should have 5 toes on each foot. And should be dark skined all over the whole body. Some Showgirls have whats called a bowtie. Thats the fluffy part on the front of there neck. Some do not have this. Some are beared and some are not. They have small eggs, there colors of there eggs can be from a white cream color to a tan colored. This is a Partridge Showgirl chick. Here is 1 White and 1 Blue Showgirl chicks. This a 2 month 2 week old White Showgirl Pullet. And yes even a male is called a showgirl even though it is a male. There is sometimes confusion on that term. I want one so nad but there seems to be NONE in Canada. Shocker. Congrats and what beautiful chickens these Showgirls are!